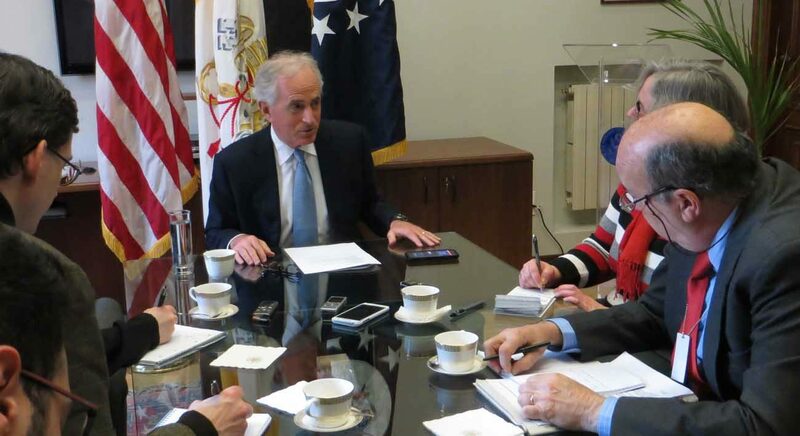 ROME (CNS) — U.S. Sen. Bob Corker, R-Tennessee, chairman of the Senate Foreign Relations Committee, met Feb. 23 with Cardinal Pietro Parolin, Vatican secretary of state, to discuss U.S.-Vatican cooperation in fighting human trafficking and ending modern slavery. Pope Francis repeatedly has highlighted the connection between restrictive immigration policies and the growth of human trafficking. “Obviously, the migrant issue and the crisis it has generated there makes people even more vulnerable,” Corker said. The senator said he believed Trump’s executive orders on immigration were just the first step in a more comprehensive reform of U.S. immigration policy. “My hope is that what this is going to lead to is an immigration policy where we deal with the whole issue,” he said. “We’re beginning on the security front,” which responds to the concerns of many Americans. Corker said he did not meet Cardinal Parolin has an emissary of the White House, but he does hope Trump will meet Pope Francis in May when the president is scheduled to be in Italy for a summit of the G-7 countries. Corker was not the only member of the Senate Foreign Relations Committee to visit the Vatican in late February. Sen. Tim Kaine, D-Virginia, attended Pope Francis’ general audience Feb. 22 and spoke with the pope afterward about “the global refugee and migrant crisis,” his office said in a statement. “As the pope stated so clearly yesterday (Feb. 21), it is a ‘moral imperative’ to protect and defend the ‘inalienable rights’ of refugees and respect their dignity, especially by adopting just laws that protect those fleeing dangerous or inhumane situations,” Kaine said. The senator’s office said he also met with Archbishop Paul Gallagher, who is the Vatican foreign minister, participated in a discussion focused on Latin American issues with Vatican officials and met with the Jesuit Refugee Service to discuss its work with refugees and asylum seekers.